An artist's view of the Herschel satellite with the at present largest telescope mirror in space, which carries the HIFI instrument. ESA’s Herschel Space Observatory has revealed the chemical fingerprints of potential life-enabling organic molecules in the Orion Nebula, a nearby stellar nursery in our Milky Way galaxy. This detailed spectrum, obtained with the Heterodyne Instrument for the Far Infrared (HIFI) - one of Herschel's three innovative instruments - demonstrates the gold mine of information that Herschel-HIFI will provide on how organic molecules form in space. Several German Institutes contributed essential parts to the HIFI instrument: the Universität zu Köln and two Max Planck Institutes: Radioastronomie (Bonn) and Sonnensystemforschung (Lindau). 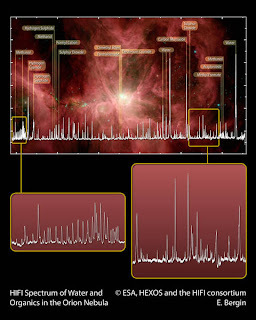 Striking features in the HIFI spectrum include a rich, dense pattern of “spikes”, each representing the emission of light from a specific molecule in the Orion Nebula. This nebula is known to be one of the most prolific chemical factories in space, although the full extent of its chemistry and the pathways for molecule formation are not well understood. By sifting through the pattern of spikes in this spectrum, astronomers have identified a few common molecules that appear everywhere in the spectrum. The identification of the many other emission lines is currently ongoing. By clearly identifying the lines associated with the more common molecules, astronomers can then begin to tease out the signature of particularly interesting molecules that are the direct precursors to life-enabling molecules. A characteristic feature of the Orion spectrum is the spectral richness: among the molecules that can be identified in this spectrum are water, carbon monoxide, formaldehyde, methanol, dimethyl ether, hydrogen cyanide, sulphur oxide, sulphur dioxide and their isotope analogues. It is expected that new organic molecules will also be identified. “This HIFI spectrum, and the many more to come, will provide a virtual treasure trove of information regarding the overall chemical inventory and on how organics form in a region of active star formation. It harbours the promise of a deep understanding of the chemistry of space once we have the full spectral surveys available,” said Edwin Bergin of the University of Michigan principal investigator of the HEXOS Key Programme on Herschel. Identification of the many spectral features visible in the Orion spectrum with transitions of particular molecular species requires sophisticated tools such as the Colgone Database of Molecular Spectroscopy (CDMS), which collect the laboratory data of several hundred moelcular species and precise line predictions. “The high spectral resolution of HIFI shows the breath-taking rechness of molecular species, which are present, despite of the hostile environment, in the stellar nurseries and sites for planet formation”, says Jürgen Stutzki, HIFI-co-principle investigator at the Universität zu Köln. 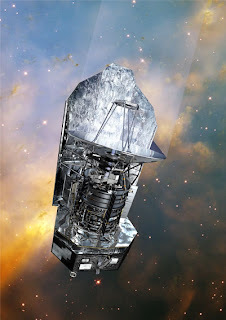 Herschel is one of ESAs cornerstone missions, a space observatory with science instruments provided by European-led Principal Investigator consortia, with important contributions from NASA on the US side. One of the three instruments on board Herschel is HIFI, the Heterodyne Instrument for the Far-Infrared, .an ultra-sensitive, high resolution spectrometer designed and built by a nationally-funded consortium led by SRON Netherlands Institute for Space Research. The consortium includes partners from 25 institutes and 13 different nations. German institutes have provided key components for HIFI: the local oscillator, built at the MPI für Radioastronomie, Bonn, superconducting detectors with sensitivity close to the fundamental quantum limit, built at the Universität zu Köln. HIFI carries the classical radio frequency technique of heterodyne-mixing into a for orders of magnitude higher fequency regime, namely the Far-Infrared spectral range. A further essential component, the Acousto Optical Spectrometer (AOS), was developed in collaboration between the Universität zu Köln and the Max Planck Institut für Sonnensystemforschung, Lindau.